Concept: Pit NatureSweet products against each other in a Bowl Builder game to build the ultimate fan faves recipe. Objectives: Drive brand engagement and sign-ups through a sweepstakes driven by a social fan faves game. The team at NatureSweet is asking fans to pick their favorites to make the ultimate game-day Bowl recipe. 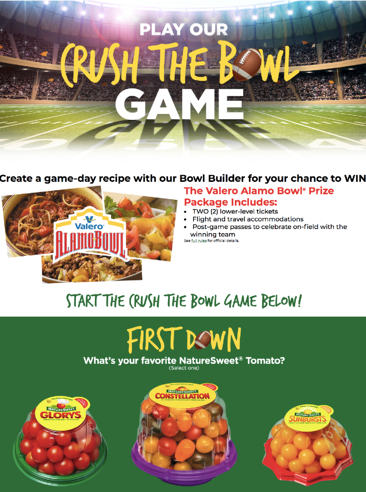 Fans can create their game-day recipe with NatureSweet’s Bowl Builder for the chance to win The Valero Alamo Bowl® Prize Package, which includes TWO (2) lower-level tickets, Flight and travel accommodations, as well as post-game passes to celebrate on-field with the winning team. To engage their fans, they created a social game that pitted their own products against each other to create unique recipes based on their fan’s choices. NatureSweet’s social game is unique way to engage and have fans interact with key products. Giving fans the chance to curate their own recipes online for a chance to win paid off for NatureSweet, with an exceptional DCI score of 298. You can check out their Game Day “Crush the Bowl” social game HERE. NatureSweet’s kicked it out of the stadium with their “Crush the Bowl” game with a DCI score of 297, which is a combination of an Engagement Score (ES) of 447 and Virality Score (VS) of 147. Leveraging interaction, a combination of Use Cases, and a timely prize, NaureSweet made the perfect play to increase visits and form submissions. Appeal to your consumers’ inner critic. Whether we like to admit it or not, we all like to think we have the best taste and we know what we want and like. NatureSweet gave their fans the chance to play the critic and select their choice for the best designed recipe, a great way to encourage engagement. Timing is everything. It’s important to ensure your campaign is timely to guarantee that it won’t be a total flop. Consumers are more likely to engage with a campaign that aligns with their current conversations, interests and activities -- and the content they’re sharing. Stagger your prizes or offer a multi-prize package. People love prizes! A great way to ensure consumers continue to engage with your campaign is to space out the prizes across multiple days, weeks, or months, or offer a multi-stage prize package. Staggering the prizes provides more opportunities for your consumers to win and will increase the likelihood that they continue to share and engage with your brand throughout the campaign. Make sure to check out NatureSweet’s campaign and create your own game day recipe here.